The KH-9A spacecraft evolved from a long series of design studies built around the primary optical imaging systems and the need to extend the coverage over a longer period of time. Its length is close to 53.17 feet with a maximum body diameter of 10 feet not including the deployed solar arrays. The “Big Bird”-A Spacecraft weighs in at approximately 22,800 lbs. It is partially encapsulated in a 10 foot diameter shroud with a length of 55.17 feet over the maneuvering nozzle. The KH-9 spacecraft carries the standard Lockheed earth, horizon and sun sensors as well as altimeters. It carries its own sextant star tracker system for navigation and film imagery reference. 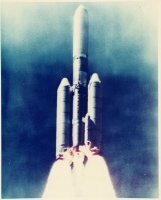 The spacecraft was designed to carry any where from three to a maximum of four sub satellite for release once in orbit for various ELINT, COMINT, and SIGINT missions. Each spacecraft was equipped with at least four film return capsules for the imaging system use over the life of the spacecraft mission. In some cases a mapping camera was used in place of a film return capsule to obtain needed mapping imagery that was a quality of higher developed ERTS imagery developed after this was accomplished by the Defense Mapping Agency (DMA) through the KH-9 spacecraft. Each spacecraft is believed to have had an instrument, film supply section directly above the Satellite Control Section service module of the spacecraft. It is known that at least the first 12-16 KH-9A film imaging reconnaissance spacecraft missions utilized what has been revealed and labeled as the Satellite Control Section (SCS) that was the presumed precursor to the SSB Satellite Support Bus also used by the KH-11, KENNON reconnaissance electro optical imaging spacecraft. Little is known about the original KH-9A bus design called the Satellite Control Section spacecraft service propulsion, power bus module. It was used on at least 12 or 16 of the 20 flights of the “Big Bird” KH-9A reconnaissance imaging Hexagon spacecraft. The SSB’s were introduced during the latter part of the KH-9 program retrofitted to the KH-9B last eight to four spacecraft in place of the older outmoded SCS bus modules. Characteristics of the SSB are noted below from the Lockheed released information. For further details on the design differences for the SCS verses the SSB see the schematics web pages.